U.S. authorities on Wednesday seized a cross-border tunnel that ran the length of four football fields from a restaurant in Mexicali, Mexico, to a newly built house in Calexico, California, following an investigation that netted more than a ton of marijuana and resulted in four arrests. The tunnel was the 12th completed secret passage that U.S. authorities have discovered along California's border with Mexico since 2006. They have found more than 75 along the entire U.S.-Mexico border in the last five years, mostly in California and Arizona and many of them incomplete. Drug traffickers allegedly purchased the Calexico property in April for $240,000 and finished building a three-bedroom house on the parcel for $86,000 by December. Prosecutors say the first tunnel shipment occurred Feb. 28, leading to the seizure of 1,350 pounds of marijuana in West Covina, near Los Angeles. The tunnel extended about 300 yards in Mexico from El Sarape Mexican restaurant and ran about 100 yards on U.S. soil to the house in a quiet residential area of Calexico, a city of about 40,000 people located 120 miles east of San Diego. 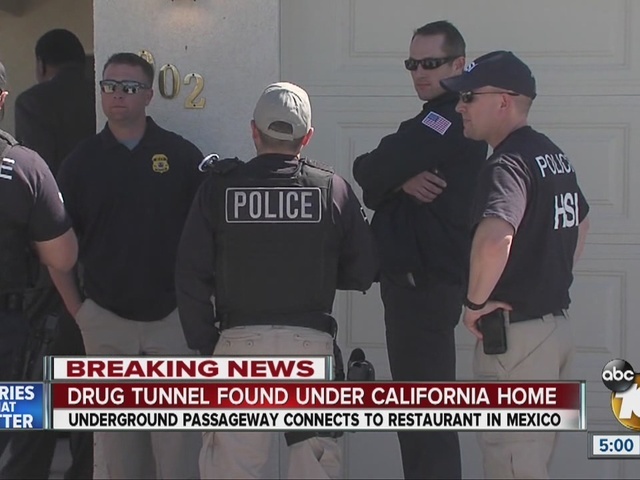 "This house and tunnel were constructed under the watchful eye of law enforcement," said Laura Duffy, U.S. attorney for the Southern District of California. "For the builders, the financiers and the operators of these passageways, there is no light at the end of the tunnel. We will seize your drugs and your tunnel before you even have a chance to use it." Two men were arrested Wednesday in Calexico — one at the tunnel house and another at a house believed to have been used to store drugs — and charged drug trafficking crimes, authorities said. Two women were arrested Tuesday in Arizona, including the purchaser of the Calexico house. Dave Shaw, special agent in charge of U.S. Immigration and Customs Enforcement's Homeland Security Investigations in San Diego, said the investigation was "still very much ongoing." Mexico's Sinaloa cartel has long controlled drug trafficking along the border in California's Imperial Valley, which offers easy freeway access to Los Angeles and Phoenix. The group's leader, Joaquin "El Chapo" Guzman, escaped from Mexican prison in July through a tunnel and was captured again in January. 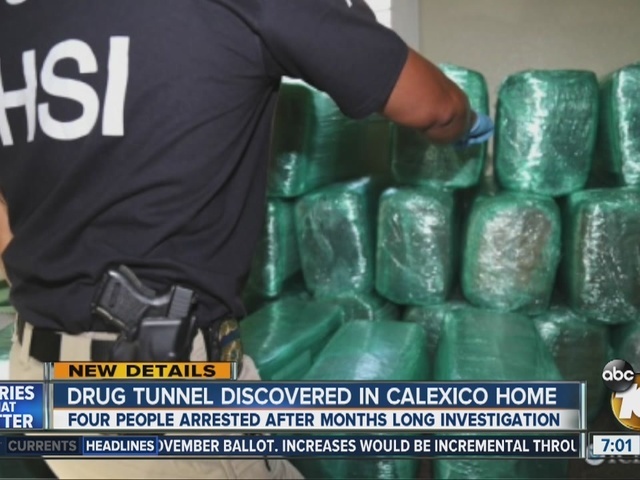 The latest discovery is the first completed tunnel found in a decade in Calexico, which is less of a draw for drug traffickers because the soil is harder and the city is largely residential, authorities said. San Diego is popular because its clay-like soil is easy to dig and its Otay Mesa is industrial and has many large warehouses considered ideal for storing and moving drugs.